The three shots which constitute the opening sequence: the phrase "A long time ago in a galaxy far, far away....", the Star Wars logo and the opening text, from the beginning of Star Wars: Episode IV – A New Hope. The opening crawl is the signature device of every numbered film of the Star Wars series, an American epic space opera franchise created by George Lucas. It opens with the static blue text, "A long time ago in a galaxy far, far away....", followed by the Star Wars logo and the crawl text, which describes the backstory and context of the film. The visuals are accompanied by the "Main Title Theme", composed by John Williams. This sequence has featured at the beginning each of the main Star Wars saga theatrical films produced by Lucasfilm. Although it has retained the same basic elements, the opening crawl has significantly evolved throughout the series. It is one of the most immediately recognizable elements of the franchise and has been frequently parodied. The opening crawl was not used in the Star Wars "Anthology" films, Rogue One and Solo, although both films begin with the opening text, "A long time ago in a galaxy far, far away....". Additionally, the opening sequence of Solo continues with a short backstory presented in the same style as the opening text. Each film opens with the static blue text, "A long time ago in a galaxy far, far away....", followed by the Star Wars logo shrinking in front of a field of stars, as if moving away from the viewer. Initially the logo's extremities are beyond the edge of the frame. While the logo is retreating, the "crawl" text begins, starting with the film's episode number and subtitle (with the exception of the original release of Star Wars – see below), and followed by a three-paragraph prologue to the film. The text scrolls up and away from the bottom of the screen towards a vanishing point above the top of the frame in a perspective projection. Each version of the opening crawl ends with a four-dot ellipsis, except for Return of the Jedi which has a three-dot ellipsis. When the text has nearly reached the vanishing point, it fades out, the camera tilts down (or, in the case of Episode II: Attack of the Clones, up), and the film begins. Several words are in all-capital letters to stress their importance: "DEATH STAR" in Star Wars, "GALACTIC EMPIRE" in Return of the Jedi, "ARMY OF THE REPUBLIC" in Attack of the Clones, "FIRST ORDER", "REPUBLIC" and "RESISTANCE" in The Force Awakens, and "FIRST ORDER" and "RESISTANCE" again in The Last Jedi. Each line of the text spans the width of the screen when it enters from the bottom. In the "fullscreen" (4:3 aspect ratio for standard-definition television) versions of the films, the full lines of text are cut off on the sides until they have scrolled further onto the screen. As a result, by the time the full lines are visible, the text is much smaller and harder to read. In addition, the viewer also has less time to read it. The opening crawl as seen at the beginning of an episode of Flash Gordon Conquers the Universe. Lucas has stated that the opening crawl was inspired by the opening crawls used at the beginning of each episode of the original Flash Gordon and Buck Rogers film serials, which were the inspiration for Lucas to write much of the Star Wars saga. The development of the opening crawl came about as part of a collaboration between Lucas and the seasoned film title designer Dan Perri. In 1976, Lucas invited Perri to Industrial Light & Magic, Lucasfilm's post-production operation at Van Nuys, California. Perri, who had previously worked on Close Encounters of the Third Kind and The Exorcist, suggested that they take inspiration from the 1939 Cecil B. DeMille film, Union Pacific, whose opening credits are shown distorted by a sharp perspective and rolling along a railroad track towards a distant vanishing point. Lucas was keen on the idea and Perri developed sketches and prototype mechanical artwork. One of the earliest iterations of the opening crawl is evidenced in storyboards drawn by the production artist Alex Tavoularis, depicting the title “THE STAR WARS” as a three-dimensional logo. Perri also designed a logotype, consisting of block-capital letters filled with stars and skewed towards a vanishing point to follow the same perspective as the opening crawl. Lucas eventually rejected Perri's logo due to readability problems, turning instead to the graphic designer Suzy Rice, an art director at the Los Angeles advertising agency Seiniger Advertising. Lucas had commissioned Rice to design a promotional brochure that was to be distributed to cinema theatre owners. He instructed Rice to produce a logo that would intimidate the viewer, and he reportedly asked for the logo to appear "very fascist" in style. Rice, inspired by historical German typography, produced a bold logotype using an outlined, modified Helvetica Black. After some feedback from Lucas, Rice decided to join the S and T of STAR and the R and S of WARS. Lucas's producer, Gary Kurtz, found that Rice's logo worked well in the opening title; the logo was modified further to flatten the pointed tips on the letter W before it was inserted into the final cut. While Perri's skewed logo did not appear on-screen, it was used widely on pre-release print advertising, and it featured prominently on film posters promoting the release of Star Wars on cinema billboards in 1977 (notably Tom Jung's Style ‘A’ poster, the Style ‘B’ poster by the Brothers Hildebrandt and Tom Chantrell's Style ‘C’ poster). In a 2005 interview, George Lucas described how the final phrasing of the text for Star Wars came about. "The crawl is such a hard thing because you have to be careful that you're not using too many words that people don't understand. It's like a poem. I showed the very first crawl to a bunch of friends of mine in the 1970s. It went on for six paragraphs with four sentences each. Brian De Palma was there...". De Palma helped to edit the text into the form used in the film. According to Dennis Muren, who worked on the six films, crawls on the original trilogy films were accomplished by filming physical models laid out on the floor. The models were approximately 60 cm (2') wide and 1.80 m (6') long. The crawl effect was accomplished by the camera moving longitudinally along the model. It was difficult and time-consuming to achieve a smooth scrolling effect. Furthermore, different versions in other languages (such as German, French and Spanish) were produced by Industrial Light & Magic. With the advent of computer-generated graphics, the crawls for the prequel trilogy were achieved much more quickly. The 2004 DVD special edition versions of the original trilogy were later updated with computer-generated crawls as part of their restoration and enhancement. Lucasfilm president Kathleen Kennedy stated that the 2016 spin-off film Rogue One would "more than likely" eschew certain traditional elements of the franchise, including the crawl, in an effort to distinguish it from the main film series. In fact, Rogue One retains "A long time ago, in a galaxy far, far, away...", but then immediately cuts to the opening scene with no crawl. At the end of the opening scene, the title "ROGUE ONE" recedes against a star field, like the "STAR WARS" title of the main series, then there is a cut to the next scene. The second spin-off film Solo does not feature a crawl, but does feature an introductory text shown sentence by sentence in the same font and color as and immediately after "A long time ago, in a galaxy far, far away....". This places it halfway between Rogue One and the main saga. The opening crawl in the first Star Wars film is very different from Lucas's original intention. The original text, used in the rough cut he showed to friends and studio executives in February 1977, appears in the Marvel Comics adaptation of the film. When originally released in May 1977, the first film was simply titled Star Wars, as 20th Century Fox forbade Lucas to use a subtitle because it could be confusing, since there had been no other Star Wars movies prior to 1977. In addition, it was not certain if the film would be followed with a sequel. When The Empire Strikes Back was released in 1980, the episode number, "Episode V", and subtitle "THE EMPIRE STRIKES BACK" appeared as the first two lines of the opening crawl. To match its sequel's crawl, the episode number "Episode IV" and subtitle "A NEW HOPE" were added for the film's theatrical re-release in April 1981. The original version, without the subtitle, was not released again until the 2006 limited edition DVDs. Also, it should be noticed that the original version of Episode IV's crawl does feature a lowercase "R" for "Rebel spaceships", as, at the time, "Rebel" (in its Star Wars meaning), just like "Imperial", was not considered some sort of demonym-like adjective as it is now. ^ Perkins, Will (16 December 2015). "Star Wars". Art of the Title. Archived from the original on 2 April 2016. Retrieved 8 June 2016. ^ Taylor, Chris (2014). "11. The First Reel". How Star Wars Conquered the Universe: The Past, Present, and Future of a Multibillion Dollar Franchise. Head of Zeus. ISBN 9781784970451. Retrieved 1 June 2016. ^ "Evolution of the Star Wars Poster". PhotoSecrets.com. Archived from the original on 28 July 2017. Retrieved 28 July 2017. ^ Pearlman, Cindy (May 15, 2005). The Force. Chicago Sun-Times. ^ Alexander, Julia (November 22, 2016). "Rogue One is bucking a Star Wars tradition". Polygon. Vox Media. Retrieved March 13, 2018. ^ Does Solo: A Star Wars Story have an opening crawl? ^ "Star Wars: Episode IV A New Hope". StarWars.com. 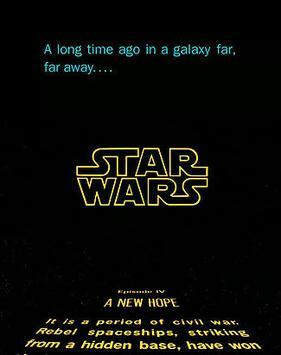 "Star Wars: Episode IV A New Hope - Opening Crawl". official Star Wars website. Retrieved 8 June 2016. "Library of Star Wars Opening Crawls". official Star Wars website. Retrieved 8 June 2016.